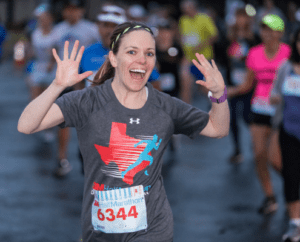 High Five Events announces 3M Half Marathon presented by Under Armour will once again partner with Goodwill Central Texas. Their involvement will ensure the course and surrounding areas are left in better condition than before race day. The 3M Half Marathon will take place on Jan. 20, 2019. Goodwill Central Texas will have collection barrels at the beginning of the event to collect any discarded clothes. Their team will also collect items discarded during the first mile. This collection leads to increased items for Goodwill and job training skills opportunities. The 25th annual 3M Half Marathon presented by Under Armour is less than three weeks away. Can you feel the excitement? There no better time like the present to take a look at some race week pro tips. These pro tips range from week of tips to what we strongly encourage you do once you cross the finish line. 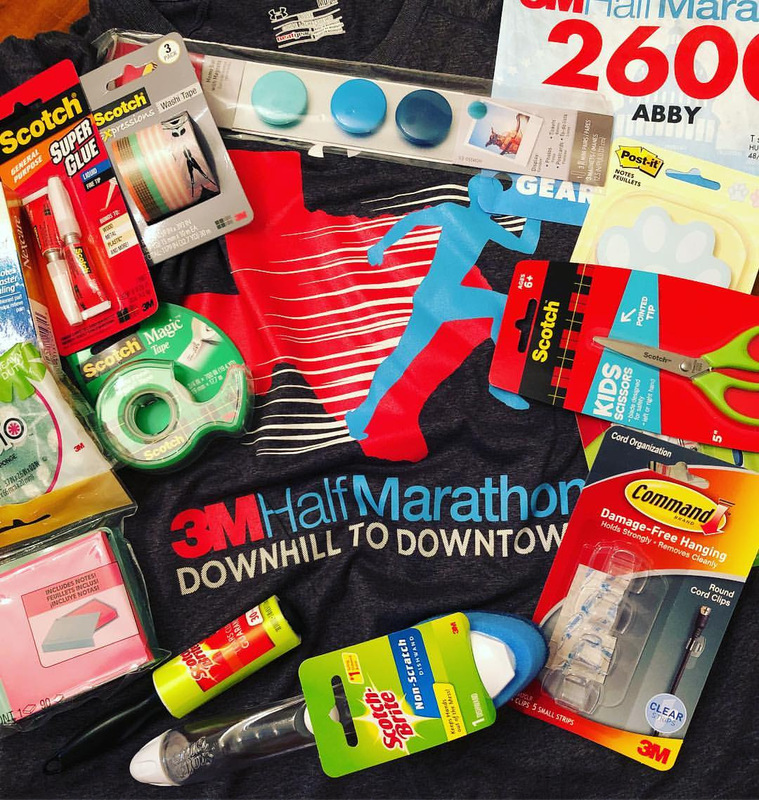 Whether this is your first 3M Half or your 13th, these pro tips will set you up for success! Let the professionals from FinisherPix capture your race day memories. Take advantage of the pre-race prices and order your photos today. Once the race begins prices go up! BONUS – follow these tips to get your best race-day photos. Show off that PR! Customize your commemorative 25th anniversary 3M Half Marathon spinning medal. Learn how you can personalize it with your name and finishing time. It’s no secret, the first hour of expos is always the busiest. There’s an energy because of race weekend, the opening of the expo, and the industry’s top vendors gathered all in one place. Add the buzz from amped participants wanting their Under Armour shirt and world-famous 3M Half swag bag and you have a recipe for a busy first hour! Get a good night’s sleep before race day, wake up feeling refreshed, and walk to the start line! Book your hotel today and utilize the great rates secured by onPeak, our hotel partner. Just think, you won’t have to worry about parking race morning! Want something specific at the finish line? Don’t forget to drop off your gear bag. We’ll take it to the finish line for you, for FREE! The excitement at the start of the 3M Half Marathon is undeniable. Don’t get caught up and go out too fast! Running with the professional, Austin-based Twenty-Six Two Pace Team is an excellent way to reign in your desire to lay down the hammer. If you stayed near the start line, shuttles will take you from the finish line back to the start line after the race. Don’t worry, there will be plenty of time for you to celebrate with friends and family at the finish line festival! Shuttles will be located on San Jacinto Street between 11th and 12th Street. NOTE – shuttles are not available prior to the race. You’re registered. You’re training. You have a goal time in mind. This is your first half marathon. You want to PR. You want to beat last year’s time. Whatever your race day goals, the Twenty-Six Two Marathon Club pacing group will guide you. Meet your 2018 3M Half Marathon pace team, learn where to find them on race day, and read a few dos and don’ts of running with a pacing group. Look for the Twenty-Six Two pacing group in the starting corrals holding pace signs. Those signs correspond to the paces designated by signs in the corrals. There will be two pacers per each pace group (finish times of 1:30, 1:35, 1:40, 1:45, 1:50, 1:55, 2:00, 2:05, 2:10, 2:15, 2:20, 2:25, 2:30). The pacers will also be wearing matching running outfits that say “PACER” or otherwise designated them as official 3M Half Marathon pacers. DO ask questions before the start about your pacing group’s race plan. Most will run slightly slower at first, and then pick up speed in the middle miles of the race. However, each pace group is slightly different, so make sure to ask any questions before the race begins. DO drink at water stations along the way if you normally take water or sports drink during the race. The pacing group will slow down slightly to allow runners to catch up after water stops. DO ask questions or introduce yourself during the race if you are inclined. The pacers are all accustomed to racing at paces faster than what they are pacing, so they should be able to answer your questions. Summer (4256) and Steve (4530) will lead the 2:05 group for 2018. Claire (5241) will lead the 2:15 group for 2018. DO ask what your splits should be at each mile marker, and compare the pacers’ times with your watch or GPS device. You want to make sure that you are “in sync” with the pacers’ official times. DO relax and let the pacing group guide you! They are trained to finish at (or slightly faster than) their designated finish times. DON’T struggle to stay right next to or behind the pacers, especially at the beginning when it is crowded. As long as you are near them along the way, you will have plenty of time to stick with them after a few miles. DON’T try to start out with a pacing group that is significantly faster than you are accustomed to running. Find the pace group that is right for you, and enjoy the race as the pacers lead you to the finish line. DON’T forget that the pacing group is targeting a finish that corresponds to their own chip time, not the official “gun time.” If your pace group crosses the start line several minutes after the race begins, the pacers will be following their own chip time, not the “clock” time at the finish. Make sure to ask along the way what the pacers’ time is, and compare it to your own time. If you are unsure whether you are “ahead of” or “behind” the pacers’ time, ask them! They will answer your questions. 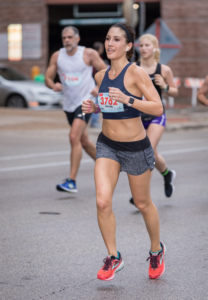 Twenty-Six Two Marathon Club (TST) is an Austin-based nonprofit group that provides low-cost training to men and women marathoners and half marathoners throughout the year. 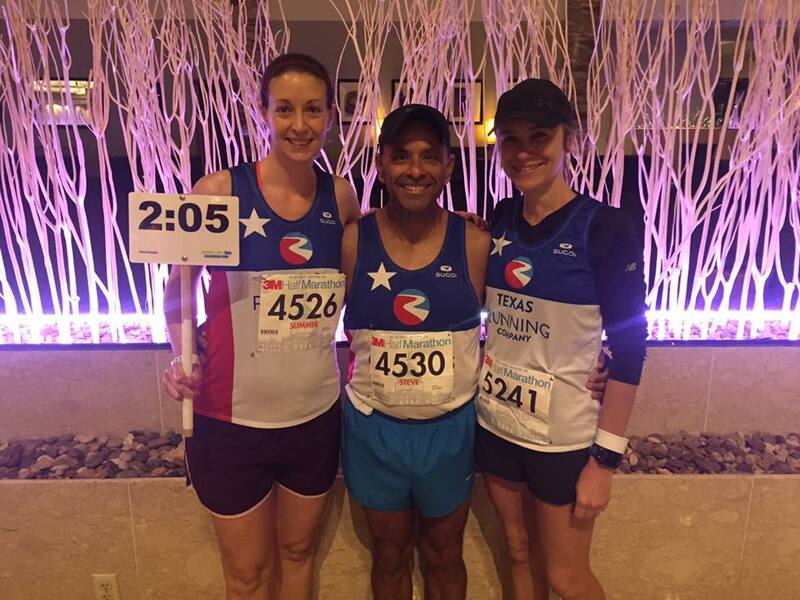 Since 2005, TST has trained hundreds of runners for races in Austin, Boston, Chicago, Dallas, Houston, New York, San Antonio, and many other cities (and countries). TST’s Pace Team provides pacers for races year-round and is comprised of club members who have run multiple marathons and half-marathons. With the holiday break just days away you might find yourself with some extra time on your hands. Or maybe you want to relax after eating a little too much. Perhaps you just need some time away from your crazy uncle Nathan. Maybe you need some downtime after your 3M Half Marathon training long run. Whatever your reason, get your favorite hydration, grab your foam roller, and click play on these running movies. If you’ve never watched this classic and paid attention to the way running is portrayed, well, it happens… Do yourself a favor and watch Forrest Gump now! The use of running in this film reflects a number of reasons why many of us run: because we’re told we can’t, escape from danger, score touchdowns, and because you feel like running. While this might not be a running-themed movie like the others on this list, the role running plays is undeniable. Just like the role running plays in your life. This documentary covers what some call the toughest ultramarathon in the world The Barkley Marathon. There were zero finishers in 2018. The ultramarathon is held in Frozen Head State Park, near a tiny Tennessee town. It accepts 35 runners a year. Lazarus Lake created the race, mocking a failed prison escape that took place nearby. The unmarked course changes every year. Participants must find hidden books and remove pages that are associated with their bib number as proof. Everyone loves the underdog story. Kevin Costner plays a former football coach turned track coach. At this new school, he discovers that some of the students he teaches are exceptional runners. They’re driven by the same factors that drive you: a desire to get better and commitment to the team. Follow their journey as they grow from beginner runners to champions. Based on a true story, Chariots of Fire is a 1981 drama that won Oscars and Academy Awards. The film follows two sprinters who compete in the 1924 Paris Olympics for different reasons. Erik Liddell believes he must succeed to spread the word of his faith. Harold Abrahams runs to be accepted and prove that Jews are not inferior. Follow the runners during their training, driven by their desires. You’ll see that the themes presented (commitment, sacrifice, devotion) mirror what you endure as a runner too. Running Brave is about Billy Mills, a Native American who grew up on a South Dakota reservation. Mills shocked the world at the 1964 Tokyo Olympics when he won the 10,000-meter run. He was a member of the Sioux tribe, ran track at the University of Kansas, and earned a spot in the Tokyo Olympics. He defeated a world-class field. No American had ever won the 10,000-meter before. The closest since Mills’ run, when Galen Rupp took silver at the 2012 London Olympics. Remember when “ridiculously photogenic guy” made is way around the internet? His race photo amazed us all. Regardless of how the race is actually going, the amount you are sweating, or the pain your feet are in, the elusive perfect running photo is actually within reach. With these 10 simple tips, you too can be like “ridiculously photogenic guy” and have race photos that you will be showing off for years to come. Stand Tall! We tend to let our shoulders lean in, so when you see that yellow vest, pull the shoulders back and align the spine. This is also probably just feel good on your body if you have gotten into a slump. Make your legs look long and fast by slightly over exaggerating your stride. You don’t want to do this for all 13.1 miles, but it won’t hurt for a photo or three. This was advice given by a wedding photographer but it also applies here. With your arms out a little bit, they don’t have the squished look like when they are pressed up against your sides. Be aware of the upcoming photographers and move so that other runners are not in your way. No point in putting in the work to look good if you are covered up by someone else. We know easier said than done, but start practicing now on your training runs. Make your cheeks soft and say the word “Money.” Seriously go to a mirror and try it. You do your hair for any other good photo… do it here too! A braid, a bun, a clean ponytail. Hats are okay at taming crazy hair, but they can also cast a shadow on your face. Have a photo mantra like ” I love running” or “I am awesome and am going to finish this race.” This positive energy will show through in the photo. You can even say something out loud to the photographer to get their attention, a whoohooooo never hurt! Make sure your bib placement is clean looking and on the front. The automated photosystems use this to tag your photos. You don’t want to sift through thousands of photos to try and find yourself. I know it is tempting to hit the pause button right when you cross the finish line, but give it a few steps. Otherwise, the photo will be of you looking at your watch and not enjoying the finish experience. 10. Bust out the major emotion! Smiles, cheers, jumps, yells, tears… you’ll get a second look from the photographers. Avoid waving quickly or flapping your arms up and down, they can make you look like your falling in the photo. If you are going to make movements, make them meaningful and keep the pose for more than a few seconds. 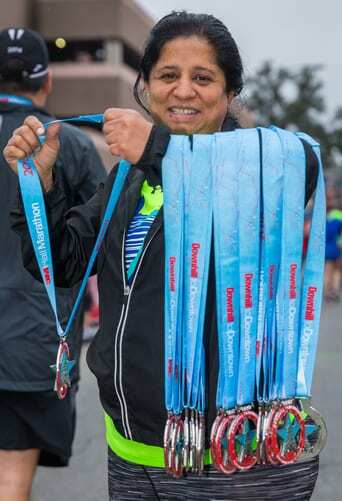 You can pre-purchase your 2019 3M Half Marathon race photos now at a discounted price. It’s no secret, running on hills is beneficial. You strengthen your lower body and your cardiovascular and respiratory systems. Over time, running gets easier, allowing you to push your body further. You think hill workouts and your mind immediately goes to the uphill climb. But don’t forget, coming back downhill is just as important. Incorporate these downhill running tips to improve your form, become a better runner, and save your legs. With a ~300 ft. elevation drop from start to finish, this advice will benefit you at 3M Half Marathon. Gravity naturally pulls you downhill (thanks Sir Isaac Newton!). Lean slightly forward from your hips, not your shoulders, to help maintain control of your body as you descend. If it helps, you can lean your shoulders back slightly, but not too much. This combination might feel awkward during your first couple of runs. Maintaining your center of gravity when running downhill will help avoid injuries and give your body a chance to recover from running uphill. Pro tip: engage your abs and glutes to provide extra control. When running downhill, you don’t need the forward-back arm movement to generate power. That’s mainly used when running on flat ground and uphill. Take the above advice and partner it with your arms. As you descend, find the arm placement that best helps you maintain your balance. Your arms will naturally move back-and-forth, that’s okay. But remember that specific movement needs to focus on balance, not power. As mentioned above, coming downhill doesn’t require as much power as going uphill. You need to alter your stride just like you altered how you use your body. Don’t overstride, you’ll overextend your body which forces you to lose control. Shorten your stride and keep your feet underneath you. You’ll feel like you should fly down the hill, but maintaining a controlled descent will benefit you during and after the race or workout. Focus beyond your feet. Continue to pay attention to your surroundings and the terrain, but don’t look at your feet. Doing so will disrupt your center of gravity and throw your stride out of sync. Adjusting your stride going downhill is designed to prevent injuries, maintain control, and allow for recovery. Looking at your feet leans your shoulders forward and disrupts your center of gravity. Then gravity takes over and you begin running faster, overextending your stride as you descend. Focus on what’s downhill and trust that your lower body will take care of you.